Home » Filmmaking » The Best Websites For Filmmakers: Directing, Cinematography, VFX, Screenwriting, And Much More! Note: Since we first published this list of 37 websites over a year ago, we’ve been inundated with numerous suggestions about sites, podcasts, and other resources we should have included in the list. Below, find the updated version with over 90 suggestions from our readers, students, and esteemed faculty and please let us know what we missed as we will continue to update this list. There are thousands of websites out there for filmmakers. Some of them are a waste of your time, others offer awesome services and resources. So we asked our film school students to share with us their favorite filmmaking websites. 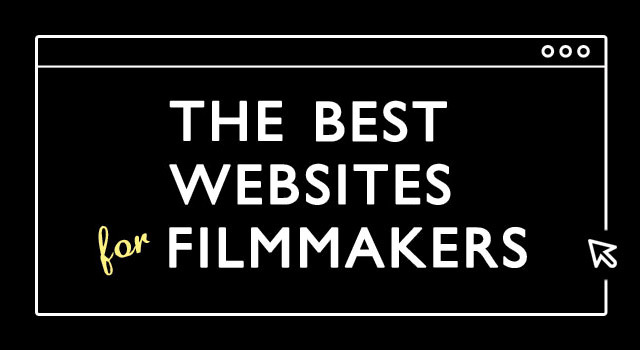 Here is our list, in alphabetical order, of the 37 best websites for filmmakers. Action-Cut-Print – Peter Marshall’s four decades of film and TV experience, distilled into this ultra-comprehensive treasure trove of filmmaking advice. AFI Podcast – The American Film Institute’s very own podcast, and one that has hosted a number of candid interviews and Q&As with the world’s most prominent directors. Link leads straight to the iTunes store. The American Society of Cinematographers – The professional guild for American Cinematographers, this site is also home to the online version of American Cinematographer, one of the most trusted cinematography magazines out there, along with providing useful professional information for younger cinematographers. Anatomy of a Scene – A wonderful feature hosted on the New York Times website, this series of videos showcases directors walking audiences through a particular scene from their films. Association of Film Commissioners International – With over 300 Film Commissions on six continents, there’s almost always an AFCI member office nearby to help you navigate local laws, customs and procedures. Art of the Guillotine – Online film community for film editors. Connect editors and future editors with ideas and techniques that make films great as well as connect them with each other. Awardeo – While the vast majority of influential film festivals still occur IRL, online film festivals are a great and easy way to earn recognition and increased visibility for your work, with this site highlighting the best filmmakers on Vimeo. AWN – If you’re involved with animation, 3D, VFX, or simply want to learn more, there aren’t many better places online where you can start your journey as AWN is literally the largest animation-related publishing group on the web..
B&H Photo, Video, and Pro Audio – Your one-stop-shop for any equipment you may need throughout the filmmaking process. BAFTA’s Soundcloud – The British Academy of Film and Television Arts has a massive backlog of interviews and their Soundcloud is dedicated to opening their archives to the public, with hundreds of recorded interviews with many of the most important names in film and television. Baseline Intelligence – This service provides a variety of pre-packaged reports on popular topics for movie producers, independent filmmakers, corporate financiers, and other entertainment entities. The Beat – Hosted by Premium Beat, this is a blog every filmmaker will want to bookmark. As well as instructional articles covering a wide range of pre- and post-production issues, The Beat regularly posts fascinating thought pieces that will change the way you think about filmmaking. BIGSTAR Movies – The site offers distribution, networking and a monthly short film contest while allowing global audiences to watch streaming films from around the world. The Black and the Blue – Whether you are looking for advice on how to navigate your first day on set or learn about more advanced skills espoused by other professionals, if you are a camera assistant, this is the site for you. The Business – Hosted by Kim Manners, editor-at large at The Hollywood Reporter, this is a great podcast covering the business side of filmmaking where she and another guest break down a certain aspect of the film business. Casting Networks – Are you looking to cast a project or are looking for casting listings? This is a great resource to find audition opportunities or actors and best of all, it’s free! CheesyCam – While there is no shortage of online camera review sites, Cheesy Cam is a unique one in that its editor comes from a still photography background, but writes actively on new DSLR cameras, tools, and techniques. A fantastic resource for photographers and cinematographers alike. Cinema5D – Like the above CheesyCam, Cinema5D is another fantastic resource for keeping up on the latest news and reviews surrounding filmmaking technology that stands out from other tech sites. Cinephilia and Beyond – A fantastic collection of resources on all things cinema: screenplays, interviews, videos grouped around themes, films or directors. CorridorDigital – Many of you will be aware of this insanely slick YouTube channel which mashes together viral short ideas with exceptional special effects, but it’s the “how it was made” channel that filmmakers will want to check out for a regular dose of inspiration. Creative Cow – An excellent source of info on video production, with a lot of professionals and production experts hanging out in the comments and ready to answer any question you may have. D4Darious – A dedicated YouTube channel by an emerging filmmaker who relays his personal filmmaking experience through a series of filmmaking and screenwriting tips for beginners and experts alike. Done Deal Professional – A crucial tool for screenwriters, producers, and filmmakers alike, Done Deal Pro tracks the various script, book, treatment, and pitch sales and options made in Hollywood and abroad, helping those who want to keep track of what material is being set up and the latest trends. The site is also a great resource for getting production forms. Drop.io – Use drop.io to privately share your files and collaborate on screenplays, film productions and animations in real time by web, email, phone, mobile, and more. Detonation Films – Detonation Films is dedicated to putting the fun back in filmmaking by establishing a new paradigm between digital media and online entertainment. And also by blowing stuff up. DVcreators – Advocates for digital video since the early 1990s, this site provides excellent training and resources for digital video makers. DVXuser – An online community for filmmaking where you can network and chat with thousands of other filmmakers while also providing plenty of tutorials. Earth Protect – With over 2,000 videos online about the environment and environmental issues and solutions, this site will help you to be a more eco-minded filmmaker and show you how to get involved. ExploreTalent – Auditions and job listing board for productions and casting calls across the country. The site also contains advice from established actors and celebrities. Film & TV Pro – Looking for a bit of paying film work on the side while you craft your own magnum opus? This is the site you’ll want to keep an eye on. Film School Rejects – While most of the sites on this list are resources for filmmakers, Film School Rejects combines film and TV reviews with broader cultural analysis and fantastically-curated video playlists that will simply help to expand your film vocabulary and knowledge. Film Riot – Ryan Connolly’s critically acclaimed tutorial site which provides a fresh and funny take on filmmaking how-to’s. Filmmaker IQ – As well as technical tutorials and guides on the process of filmmaking, Filmmaker IQ explores the ‘whys’ of filmmaking just as much as the ‘hows’. Filmmakers Alliance – Since 1993, this nonprofit organization has utilized community action to help advance independent film and filmmakers while providing mentoring from other users. Filmspotting – A podcast hosted by writers Adam Kempenaar and Josh Larsen, each episode they tackle a new top five list that reveal the cinematic precedents for certain themes, genres, and aesthetic conventions. Freesound – A collaborative database of Creative Commons licensed sounds and music that can be used for a wide range of genres and projects. FX Guide – Hosting articles and a large library of podcast episodes of various FX topics, FX Guide is a great site for filmmakers andVFX artists alike to better understand the craft. Go Into the Story – A highly acclaimed screenwriting blog by Scott Myers (and the official blog of The Black List), dive in for superb writing advice, reader Q&As as well as regular challenges and articles which get right to the heart of the craft. Google Art Project – Looking for visual inspiration for your script or a project that you are filming? Google’s Art Project offers endless visual inspiration from around the world and throughout time. Greenlight My Movie – If you have a short film, web series, movie pitch, idea for a TV show, or more and do not have representation or a buyer, use Greenlight My Movie to submit and/or pitch your material directly to Hollywood production companies, studios, agencies, and management companies. Also contains solid pieces on screenwriting and where to find funding for your project. The Hurl Blog – The Hurlbut Visuals blog is one which filmmakers around the world have come to rely on. The scope of the blog is huge, so be sure to select your area of interest via the dropdown category menu. Hollywood OmniBook – From agents to extras to screenplays for sale, the Hollywood OmniBook is your one stop source for connecting with Hollywood. Incompetech – A huge database of exceedingly well-produced, free to use music which many indie filmmakers have come to rely on (and fully searchable by genre, instrumentation and even “feel.”) Maintained by Kevin MacLeod, who we previously declared the nicest guy in the music industry. Independent Filmmaker Project – Representing a network of 10,000 storytellers from around the world, the online hub for the Project provides a number of helpful articles and information about filmmaker meet-ups that will help you to network and make the right connections. Indie Film Hustle – Home to the top-ranked filmmaking podcast on iTunes, Indie Film Hustle is a wonderful resource of online tutorials, interviews, and informative articles that will help supplement anything you learn in class at film school, allowing you to continue your studies on your own time. indieProducer – A social networking site for Hollywood filmmakers that includes useful videos, news about film festivals, and other helpful information to help filmmakers achieve their goals. IndieWire – Geared towards both indie fans as well as indie filmmakers, this hub for independent film articles is also home to the phenomenal Shadow & Act and Women and Hollywood blogs, which track entertainment news as it relates to African Americans and women, respectively. IDA – The International Documentary Association is the ultimate authority on all things related to documentary filmmaking. IMDb – The “Internet Movie Datebase” is the go-to source for information on films, actors, producers, and other professionals in the film and television industries. If you are in the industry and don’t have a profile on IMDB, create one! InkTip – Find good screenplays and professional writers. Access is free to qualified producers, directors, agents, managers, and name actors. International Cinematographers Guild Magazine – While the print version of ICG Magazine has always been a go-to resource for cinematographers, the online version not only includes content from the magazine but also hosts plenty of web-only articles, interviews, and videos covering the various facets of cinematography. John August – The accomplished screenwriter behind such modern classics as Go and Big Fish, August uses his site to provide useful information about screenwriting, from how to deal with slumps to useful product reviews. Also the home of the Scriptnotes Podcast with over 200 episodes covering about every screenwriting topic imaginable. Learning Video – Formerly Learning DSLR Video, the LV blog is a gift to tech-heads and camera enthusiasts the world over. Dave’s video tutorials and camera kit demos are a great way to get to grip with the many facets of cinematography, particularly when it comes to digital shooting. Making Of – A great YouTube channel featuring interviews with both accomplished and up-and-coming actors and filmmakers covering countless topics. Maltin on Movies – Leonard Maltin, the legendary film critic and writer of his famous annual movie guide, which recently went out of print, takes to the internet to offer up a podcast that broadcasts his decades of insight and experience to a whole new generation. Mandy.com – International TV and film production resources that helps you to find crew members, actors, and more for your production, no matter where you are. MovieMaker Magazine – The nation’s leading magazine on the art and business of making movies and the world’s most widely read independent movie magazine. Noam Kroll – Kroll’s excellent blog on filmmaking and post-production has grown in to something of a beast since it was launched, and now stands as one of the most recommended weekly reads on the topic currently active. NoFilmSchool – Regardless of its name, many of our students and faculty champion this website as a great supplement to their film school education while providing fantastic tutorials for beginners. Philip Bloom – The BAFTA-winning filmmaker’s blog is a great port of call for those who have blockbuster ideas but an indie budget. The Post Lab – Advice on post-production issues written by independent filmmakers, for independent filmmakers. Even if you think you’ve got it all figured out, The Post Lab frequently reveals brand new ways to address a production or editing problem. Post Magazine – The online outlet for this esteemed print magazine, for three decades Post has been the trusted authority on all topics relating to post-production and is a great resource for VFX artists, digital editors, and anyone looking to learn more about post-production. Pro Video Coalition – A collection of industry specialists’ blogs, Pro Video Coalition is a great resource for video professionals with articles and tutorials covering every aspect of pre-production, production, and post-production. ProductionHub – The community search site for film, television, video, live event and digital media production, whether you are looking for work or trying to find crew for a production. The Production Booth – Everyone has a favorite cult movie and this podcast celebrates as many of them as its hosts can. But these aren’t ironic takedowns of “bad” movies, but rather attempts to cast these cult films in a whole new life. Definitely worth a listen. Red Giant – The visual effects specialists’ blog and tutorials sections form a great starting point in your journey towards better post-production SFX, featuring a nice and easy learning curve along the way. REDUser – A large and extremely helpful forum community of RED users and experts, sharing the latest tips, news, and products from RED Digital Camera. Roger Deakins – One of the world’s premier cinematographers, Deakin’s website is a must-visit for all aspiring cinematographers. One especially cool feature is that he answers users questions personally. reTooled – Ever needed tutorial-style advice on Premiere Pro or After Effects, or wanted to streamline your production workflow? reTooled is the place for you. Script Mag – One of the largest online communities for writers and filmmakers alike that hosts a large number of how-to articles, interviews, tutorials, and IRL meet-ups for screenwriters to network with their peers. Shanks FX – A YouTube channel devoted to attaining great special effects in a practical manner. Not only will you learn a few new tricks, but it also serves as inspiration for thinking outside the box. Shooting People – A great community of passionate filmmakers and a place where many a fine partnership has been forged. The SP blog is also well worth checking out. Stage 32 – A social network for film, television, and theater professionals to connect with one another and gain access to Stage 32’s impressive back catalog of educational materials. Student Filmmakers – Searchable community of filmmakers—including both new-and-emerging and professional—talents in the film world while also containing many helpful reviews of new technology, techniques, and workflows. StudioDaily – Consisting of useful videos, rich media tutorials, and daily news items, StudioDaily is focused on keeping readers up-to-date on the latest workflow developments, product releases, and emerging products. The Film Collaborative – If you’ve completed your film or you’re getting close to it, check out the Film Collaborative for help on how to best distribute your film and find an audience. Tom Cruise’s Blog – That’s right, Tom Cruise has put out a surprisingly brilliant list of resources over on his personal blog (or, at least, his team has). Although the list is mainly geared towards actors, there’s plenty of crossover here for filmmakers and producers alike. The Treatment – Hosted by the highly esteemed film critic and scholar Elvis Mitchell, each episode of The Treatment features an interview with a different filmmaker, screenwriter, actor, or other creative, though Mitchell himself often steals the spotlight through his own incisive insight. Twitch – Unrelated to the livestreaming service of the same name, Twitch is a depository for indie films and the discussion thereof, with an especially strong focus on global cinema. VFX Soldier – Written by a professional (and anonymous) VFX artist, this blog offers an unflinching look into the realities of the VFX industry, for better or worse. Video Copilot – Want to take your After Effects knowledge to the next level? Video Copilot is the site for you, with plenty of easy-to-follow tutorials and free plug-ins on offer. Videomaker – One of the earliest filmmaking magazines still going strong after nearly 30 years, now fully digitized so that you can spend hours pouring through three decades of helpful articles. Videvo – With so many stock footage and motion graphics sites out there, Videvo stands out as its massive library is 100% free to users, providing both budding filmmakers and established filmmakers with a fantastic repository. Vincent Laforet – Given that LaForet is a Pulitzer Prize-winning fine art photographer, it’s of little surprise that he also treats filmmaking with the same clinical eye. Even better for us, he’s not shy about sharing his methods with the filmmaking and photography crowd looking to soak up some of his knowledge. Visual Effects Society – The premier organization of VFX professionals, the site offers great opportunities to network and members get access to their prolific library of videos and articles. Wired Design FX – Designed for both novice and expert VFX artists, Wired’s series of VFX-focused videos helps to demystify and explain many of the tricks and tools used by professionals, as illustrated using popular movies. ZapSplat – Don’t have a gaffer artist on retainer to create your film’s sound effects? ZapSplat is a free library containing thousands of common sound effects that must might save your production a considerable amount of time and money. Learn more about the Film School at the New York Film Academy by clicking here.